The city of Luxor, as it is today, consists of three parts: the city of Luxor on the eastern bank of the Nile, the temple district Karnak and Thebes on the western bank of the Nile. Luxor’s rich cultural heritage, including monuments and other places of interest, attracts tourists from all over the world. Homer described the magnificent ancient Oriental metropolis as "the city of one hundred gates". The city of Thebes was once home to around a million inhabitants in the heyday of the Pharaonic Empire. The temples in the east of the city, and the necropolises on the western banks of the Nile continue to impress visitors to this day. The Luxor temple in the city centre is also worth a visit, slotting in perfectly at the beginning or at the end of a day’s sightseeing. 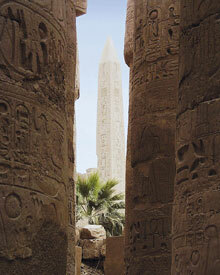 Egypt’s largest temple complex is the Karnak temple in northern Luxor. This labyrinthine structure took around 1,700 years to build. The large hall of pillars contains 134 columns in 16 rows, ranged across an area of 5408 m², and has already served as the filmic backdrop for a James Bond film. 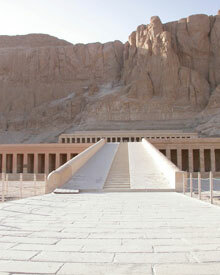 We would also recommend a visit Luxor’s little museum. The museum is extremely informative, and perfect if you want to gain an overview of the city’s history – a real insider’s tip!